So last night w had a pizza disaster... let me tell you about it. Nick makes an excellent homemade pizza. The process of making this pizza is sorta time consuming, but it's worth it. Especially to me since he does pretty much all the work. The homemade crust has to be prepared the night before and sauce at least an hour ahead of time. The cheese must be freshly grated and...well, that's it. But it feels like it takes awhile, especially on work nights. So yesterday I came in and found Nick already working on the second day preparations for our pizza dinner. I had tried to assist with the dough prep the day before, but for some reason it wasn't working for me, and eventually I just walked away and let him do his thing. But last night it felt like I should help. I grated the cheese and sorta stood around watching him... you know, doing my part. We got the first pizza in the oven without any issues, then he went to work on the second. When he was done he showed it to me proudly and said "Looks good, right?? I am getting really good at this!" We then opened the oven and I did my one job, I pulled out the rack a little so he could slide the pizza off his tray onto the pizza stone. We smiled at each other, proud of how adult and accomplished we are as the pizza slid perfectly in to place. It was a thing of beauty. Then I pushed the oven rack back in. Somehow, I can't even explain it, the rack tilted down. I guess it somehow missed it's track or something? It has NEVER happened before. NEVER! And I have been using this oven for nearly ten years! Yeah. The bottom rack caught it. It looks so sad. Right. The entire top of the pizza. Sizzling at 500 degrees. I actually gasp, and say "OH NO! Something AWFUL has HAPPENED!!" as Nick turns to see what could have gone wrong. We both stare into the oven, me wide eyed, mouth hanging open. He says "I am a little upset. Let's not talk for just a second." To which I reply "OHMYGOD I AM SO SORRY! How could that happen?? I just?? I... don't know... the pizza... it just... slid..."
He cut the surviving pizza into slices and made his plate. I just stood there. 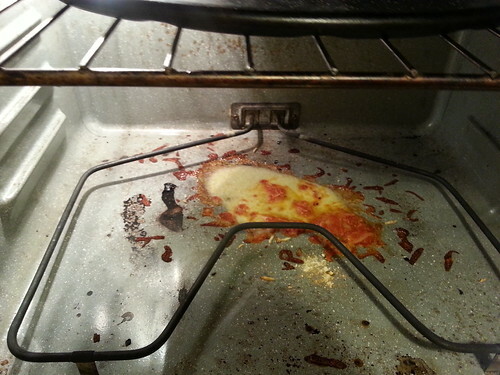 Like I was in pizza disaster post traumatic stress. What the hell. How does pizza just FALL OFF THE BAKING STONE? Finally he cracked a smile and said "Now we know where Henry gets his pitiful frown... he gets it from his Mama!" I think I looked pretty upset because then I got a hug and an "It's fine! You just killed the pizza, that's all". To which I just shook my head and laughed. I did. I killed the pizza. I'm totally impressed by your pizza efforts. We also make our own pizza, but we buy pre-made dough, used sauce from a jar, and pre-shredded cheese. We have a pizza stone also and my husband want to move his pizza making to the next level. He put a special item on our family Elfster list, and he can now cook his pizza on our gas grill. 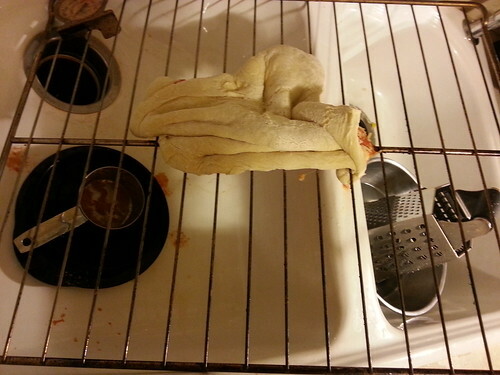 However, we have had many pizza failures like yours. A few times the dog ate the raw pizza as we were waiting for the oven to heat, other times the dough was too sticky and he just couldn't make it thin enough, and so on.